Michael Farag and Michael Shaker were accused of stealing a machine gun. 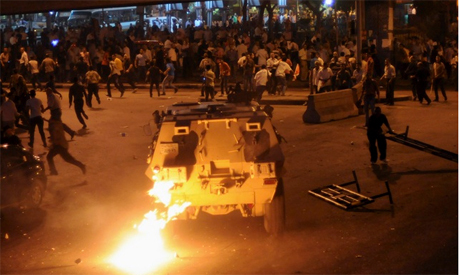 They were among the 30 Christians arrested on 9 October 2011 for inciting violence and destroying military vehicles. For the families of the 28 Christians killed in the incident, the verdict is an insult. So far, no military officer has been tried or convicted for the massacre. Cairo (AsiaNews) - Sixteen months after the Maspero building massacre that left 28 people dead, a court in Cairo sentenced two Christian Copts to three years in jail for stealing a machine gun from a soldier during the incident. Michael Farag and Michael Shaker were among the 30 civilians arrested on 9 October 2011 on charges of inciting violence, destroying military vehicles and deliberately attacking soldiers. For the Coptic community, the conviction is an insult to the victims. This Friday, the Maspero Youth Organisation, which represents victims' families, as well as pro-democracy political movements and other victims of associations plan to march from Cairo's Dawaran Shubra neighbourhood to Talaat Harb, where the Egyptian Supreme Court is located, to demand the conviction of armed forces leaders, deemed the real culprits in the massacre. Military police chief General Hamdi Badeen and his deputy General Ibrahim Damati as well as other officers are on trial for their role in the crackdown. A number of accusations have been filed in the past few months against members of the Supreme Council of the Armed Forces for issuing the order to fire on the crowd. So far, the military court has tried and convicted only three soldiers, sentencing them to three years in prison. Court papers make no mention of the attempted massacre against Copts. They also do not contain the autopsy reports showing that 12 of the victims were crushed by armed vehicles and 16 died from gunshot wounds. The paradox is that Egyptian prosecutors claim that Christians shot at their own co-religionists even though video footage shows soldiers opening fire on peaceful demonstrators and attacking people in the square.